From the Ceramic Collection. Chronograph in white ceramic with rose-gold finish accents, curved crystal, patterned white dial, luminous hands, small sweep, screw back, and double-press fold-over clasp with safety lock. 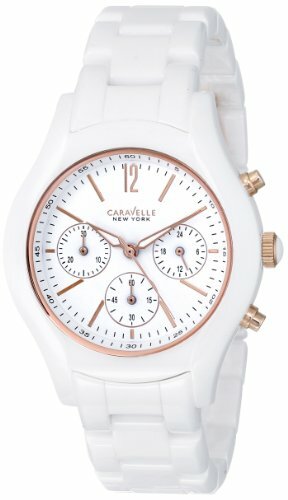 If you have any questions about this product by Caravelle New York, contact us by completing and submitting the form below. If you are looking for a specif part number, please include it with your message.